Some have called me foolish. Some have called me crazy. Some have told me they could never do it and wouldn’t even try. And if you know me, you know I love my smart phone and I love texting. I’ve talked to people at parties about how I think text messaging is better than talking. I liked texting so much, I didn’t even want the iPhone or any device without a QWERTY keyboard with actual buttons. Note: I’ve since gotten an iPhone and I still hate the keyboard, so I use Dragon Dictation. But I’ve decided …I want to talk to people. 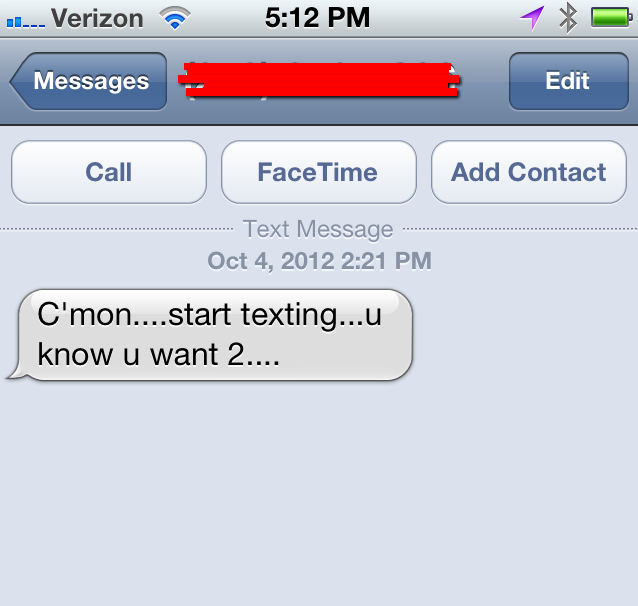 I don’t want to be known as “the guy who always sends a text.” And I don’t know that’s what I was becoming known for …but still. From now until the end of October, I’m not going to text anyone. It’s been three hours since I made this decision, and I’m being taunted and ridiculed, but I will not be deterred. Why am I doing this? I don’t know. I do things. That’s all I can say. One of the things I do when I’m not posting pictures of the ties I’m wearing and when I’m not …um …oh, man, I guess there’s not much else I do, come to think of it. Well, anyway, let’s say I had a really active social life and lots of hobbies and I did charity work …when I managed to get a break from all that stuff, I’d tell you that I write about TV shows. Namely …Survivor. But I forged ahead, undeterred, thinking everyone would want to know what I thought of a TV show instead of what they, themselves, thought of it. In the end, I was right …people loved to read about what they already watched and spunkybean was born. This, however, is not a history of spunkybean …this is a shameless plug of my writing that’s currently posted at another website. This is a blog entry with two links and some well placed keywords that will make my #Survivor recap more “sticky” and “viral”, even though I’m not sure it actually will. On Wednesday’s Survivor, someone went home who I think didn’t have to go home, and if she hadn’t taken the “I’m very angry and I’ve been wronged” approach and instead tried the “friendly” approach, I think she wouldn’t have been voted off. But it’s early, and truthfully, nobody eliminated before the merge really has any shot of being memorable. 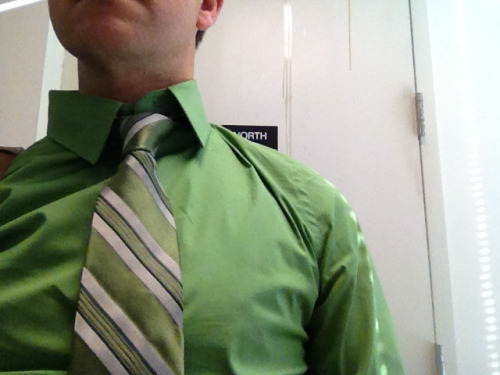 Later today there’ll be another tie and I might write about how I write about The Amazing Race. Oh, yes …I do that, too. 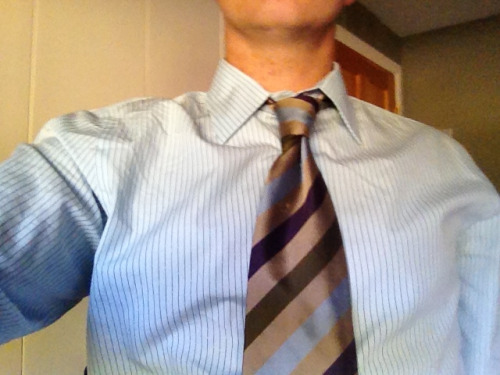 Recently, some people have scolded me for this “44 Days of Ties” experiment and pointed out, hey, you aren’t actually wearing ties for 44 days in a row. Guilty. I had high hopes that I could do that, but turns out, with the varying color schemes, I didn’t have enough shirts and had to take a few days off. 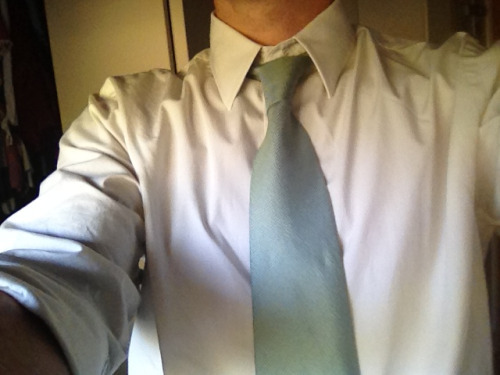 Yes, every tie goes with white shirts, but I only have three white shirts. 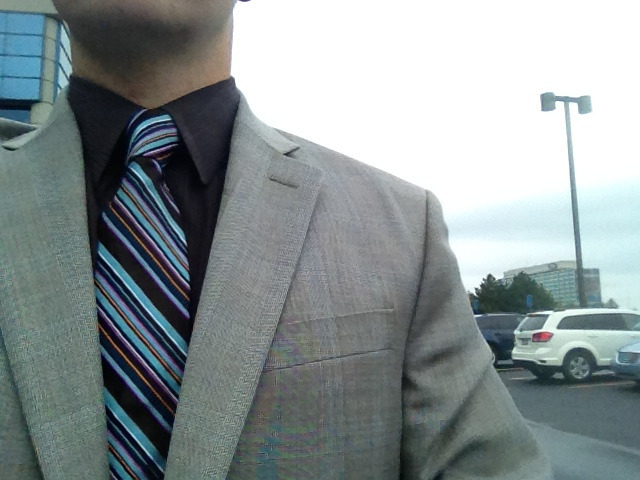 I tried to color coordinate as best I could, like with the tie above from Express Design Studio, which is very colorful and paired up nicely with a dark brown dress shirt, but other times I can’t make it work. So, if you’re not into this experiment anymore, I won’t blame you. 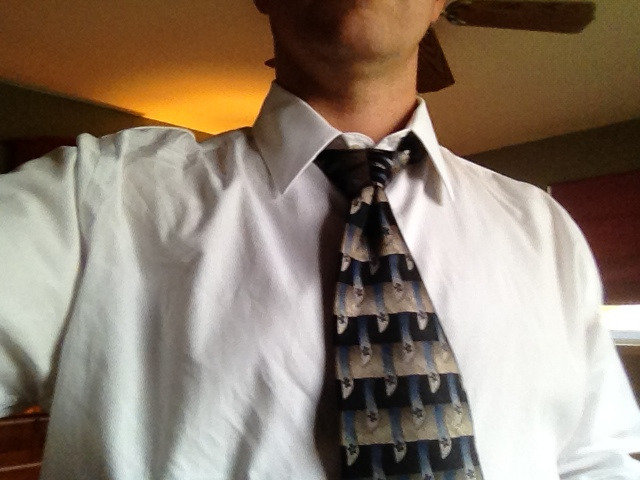 But …rest assured, I’m going to get through all my ties. Oh, and in the background, that’s Ford World Headquarters …I shouldn’t give them access to my 18 readers like this for free, but hey …I support my American car companies. 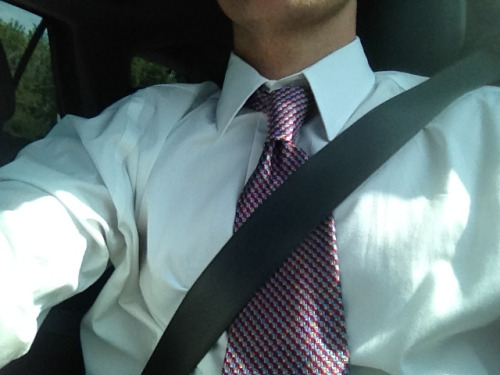 Wearing ties hasn’t been a problem, but remembering to snap a picture has proven to be quite the challenge. So, while this blog entry says I’m on Day 14, I missed about a half-dozen days. But I will get through all 44 of my ties. Today’s tie is from the Express Design Studio collection. The background to this photo is the fire exit door on the second floor of my building. About 2 months ago they, apparently, greased the hinges and used a little too much grease. How do I know? Well, every day the grease drip inches a little further down the door and nobody has bothered to wipe it off. It’s a snails pace, but it’s about 2 feet from the floor and I’m pretty excited about seeing it hit the floor. (No word on weather the door opens without squeaking or smoother).